Pyla giant sand hill, located 60 km from Bordeaux in the Arcachon Bay, France, and became the highest sand dunes in Europe. 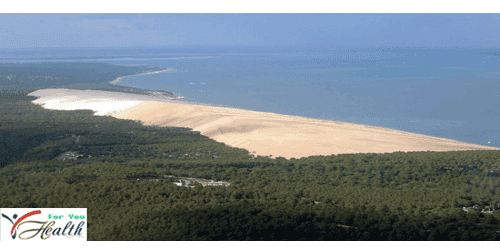 Also known as the Great Dune of Pilat, a huge sand dune this - with a width of 500 meters, a length of 3 km and towering to a height of 107 meters above sea level. Because of the beauty and unexpected location, these dunes is a famous tourist destination with more than one million visitors per year. Interestingly, as quoted from versesofuiverse.blogspot.com, the dune is moving relentlessly toward the mainland, slowly forest cover, houses, roads and even a part of the Atlantic Wall. The rate of movement of dunes is discontinuous, sometimes moving fast (10 meters in a year) and sometimes very slow (less than one meter). Over the last 57 years, these dunes have moved approximately 280 meters late. Thus the average annual movement of around 4.9 meters per year. Migration of the giant sand dunes weighing 60 million tons have been covered almost twenty private property, and every year on the eastern slope of sand covering 8000 square meters of pine forest in the vicinity. In the Northeast the dunes, there are roads covered by sand dune after sand landslide in 1987, and closed entirely in 1991. A house buried by a sand dune reported in newspapers published September 19, 1936. In the South East dunes , Bordeaux family has decided to have a villa built in 1928. Two years later, the sand began to invade the house and in 1936, the house has been completely lost buried by sand.